Adventurers travel across the state on this multisport trip, bagging Idaho's tallest peak, rafting its deepest canyon and paddling its largest lake. Highlights include; Craters of the Moon National Monument and Preserve; hiking Mount Borah (12,668 feet); a three-day whitewater rafting trip through Hells Canyon, the deepest gorge in the United States; and kayaking on Lake Pend Oreille, Idaho's largest and deepest lake. Transportation by air taxi offers outstanding views of Idaho's diverse topography and wilderness. Accommodations at comfortable inns and resorts included. Idaho is an awe-inspiring state with a web of over 3,500 whitewater river miles, dozens of mountain ranges and the largest wilderness area in the lower 48 states. Ranked 13th in area among the states, 69 percent of Idaho is public land. On this multisport journey you climb Idaho's tallest mountain on a non-technical climb, raft through North America's deepest gorge and paddle kayaks on Idaho's largest lake. This adventure vacation is accessible to anyone in reasonably fit condition. In order to cover the distances between destinations, we'll take advantage of Idaho’s superb air taxi network. This service opens our eyes to Idaho's stunning topographic diversity and gorgeous wilderness. After we climb 12,668’ Mt. Borah, our first air taxi flight travels across the state to Hells Canyon for a fun-filled three-day whitewater rafting trip on the Snake River. Carving North America’s deepest river gorge, the Snake River is an intermediate, Class III-IV, rafting trip for beginning and experienced rafters. From Hells Canyon we fly north over wild forested land into Idaho’s Panhandle where we'll land at the lakeside town of Sandpoint. Here we'll take a flat water kayak trip on Lake Pend Oreille, the largest and deepest lake in Idaho. The majority of Pend Oreille's shoreline is pristine public land. We'll paddle beneath towering cliffs and possibly spot some wild mountain goats. To expand on the adventure fun, ROW’s expert guides will share illuminating presentations about Idaho’s natural and cultural history. Superlative Idaho trips begin in Boise, Idaho and end in Spokane, Washington. Both cities are served by major airlines. If you need to purchase some gear before your whitewater rafting trip, ROW has assembled the more common items at our ROWear online store, hosted by New Headings. Arrive Boise, Idaho. Evening orientation meeting and overnight. We rise early and drive about two hours to Craters of the Moon National Monument & Preserve. Larger than Rhode Island, this little known place is a vast ocean of lava that was created during eruptions over the past 15,000 years. We hike several trails and explore within the Monument. We'll see Broken Top, the Caves and Devil’s Orchard. Late afternoon we continue to a ranch near Mackay, Idaho for dinner and overnight. Today we climb Idaho’s tallest peak, Mt. Borah. Rising 12,668 feet out of the Lost River Range, Mount Borah is perched above the Pahsimeroi and Big Lost River Valleys and offers spectacular views of the Pioneer and White Cloud mountain ranges. Our route to the top is a non-technical hike and scramble that ascends 5,500 feet from the trailhead. “Chicken-Out Ridge” is a thrilling traverse along an exposed section of the mountain. Today will be a long day, but it's filled with a great sense of accomplishment. At the end of the day we'll return to our ranch accommodations. Tonight we meet with a local conservationist to learn about land-management issues facing this part of Idaho. We take an early morning charter flight across the state to Hells Canyon on the Idaho/Oregon border. We meet our river guides at the base of Hells Canyon Dam to start a 3-day whitewater rafting trip through the deepest river gorge in the United States. 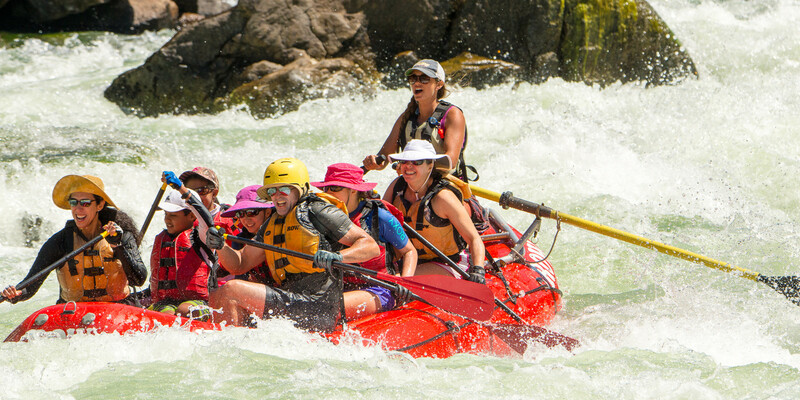 Big rapids, towering mountain scenery, Native American rock art, great fishing and idyllic camping conditions make Hells Canyon rafting an exciting three days. At the end of day three we drive out of Hells Canyon to the town of Grangeville for a taste of small-town Idaho. Another early morning flight takes us north with spectacular views as we fly over the Clearwater and St. Joe rivers, the Palouse, Lake Coeur d’Alene before arriving in the mountain-lake town of Sandpoint. Here we'll launch a full day sea kayaking tour on Idaho’s largest and deepest lake, Lake Pend Oreille. The lake is so deep that the U.S. Navy did submarine training here during WWII and still maintains a submarine research station on the massive lake. We paddle along the base of the majestic Green Monarch Mountains, where steep granite cliffs flank Lake Pend Oreille's eastern shore. There’s a good chance we'll see bald eagles, osprey, and maybe even a few mountain goats. We'll picnic on a flatstone beach surrounded by giant western red cedars. Later in the day we return to town for a presentation by a member of the Rock Creek Alliance who will share information about the ecosystem of Lake Pend Oreille and the environmental threats facing the lake. Overnight in Sandpoint to enjoy the town. Farewell dinner together. Today we take you to the airport in Spokane, Washington for your flight home. Price Includes: All transportation from Boise, Idaho to Spokane, Wash. by land and air; all meals from breakfast on Day 2 through dinner on Day 7 and hotel accommodations as noted in the itinerary. Rafting portion includes all camping and rafting gear. Does Not Include: Alcoholic beverages during the land portion of the trip; personal items; guide gratuities.